The release of Streisand’s 34th studio album is looking to set a new record for the legendary singer. According to early projections, Partners is going to shift about 160,000 copies this week with a 25k lead over her main competitor (Chris Brown), which would be enough for Barbra to land her 10th #1 album in the US. Additionally, Streisand would be the first woman to score a #1 album in 6 different decades. Starting from the 1960s, she has in fact achieved this feat in every decade of her glorious career, since her debut in 1963 with The Barbra Streisand Album. Partners is a collection of 12 duets with an all-male line up including Stevie Wonder, John Legend, Michael Bublé, Billy Joel, Lionel Richie and the late Elvis Presley. It also includes her first ever duet with her son. 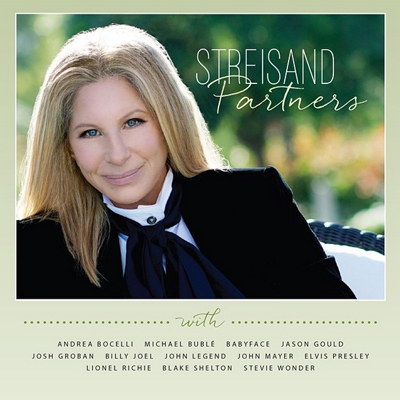 The release of the album was promoted with an appearence on The Tonight Show, where Streisand sang a medley with the host Jimmy Fallon and which likely contributed to increase her visibility. Barbra Streisand’s last #1 album was 2009’s Love Is the Answer, which was certified Gold by the RIAA with sales in excess of 500,000 copies in the United States.